Worried about parking your car in Mersing? Worry not, as there are two main car parks in Mersing. Prices are about 20 RM per day per car. In addition to VIP parking for dignitaries, a Public Car Park lot is available at Mersing Harbour Centre also. Opening hours are from 8.00 am to 6.00 pm. Cost at the Public Car Park lot is 15 Ringgit per day. Email us if you want to pre-block a car park space in advance for your vehicle at this parking. 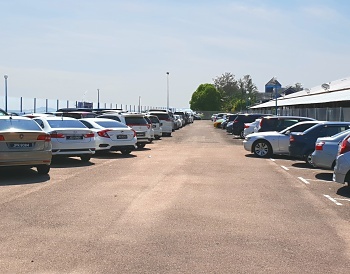 Alternatively, you may prefer to park your car at the Rawa Car Park, located directly adjacent to Mersing Harbour Centre. 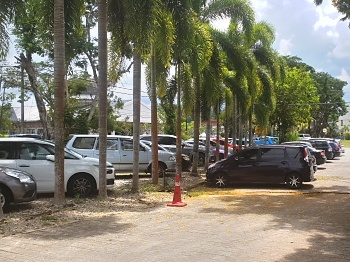 This car park is property of Rawa Island, but on days it's not full, the Rawa Car Park is available to the general public. The fee here is 18 Ringgit per day. Because of the extensive tree cover here, the Rawa Car Park has quite a few car park lots that offer protection from the elements. If you want to request for a car park space for your vehicle here, email us. 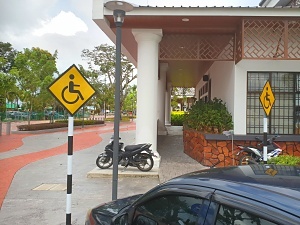 Please note: Mersing Harbour Centre also offers a Handicapped Parking Zone. Incidentally, both Mersing's car parks, the Public Car Park and the Rawa Car Park are fenced off and manned by attendants.